Best Laid PlansEliminate The Muda! My wife works really hard all year long. With the exception of her annual girls weekend to the beach she is on call 24/7 with the additional burden of often being the sole contact for all family matters due to my frequent travel schedule. Every once in a while I actually take a little time to try and do something special for her. Today was another example. We had discussed for days what to have for our meals during the holiday season. It was all planned so that we she would not have to run to the store at the last minute. Today’s dinner was to be ribs but we had debated until early this afternoon how exactly they would be prepared. 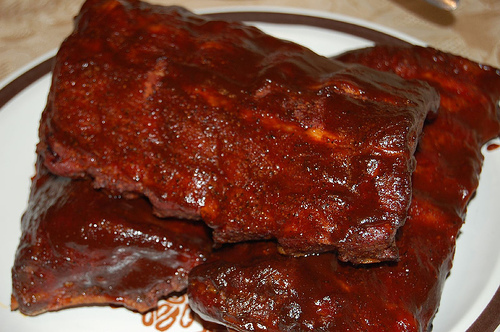 Usually we smoke the ribs, they are a family favorite. As our debate lasted until noon we realized that we were already destined to eat a late dinner if we followed through on the routine or if we were willing to experiment we could eat at a decent time and still have a nice evening with the kids. Normally, I cook anything outside, she cooks inside. Today, without discussion I took control of the experimental Dr. Pepper pork ribs. The recipe was followed exactly with a dry rub mixture applied to the ribs cooked for an hour and a half. During this time I whipped up the glaze and reduced it down to a syrupy consistency to be applied several times during the final hour of cooking. The rack was cut into thirds. At each stage my wife checked in. She suggested for the rub that I go light on one portion of the ribs. When I began applying the glaze she also suggested varying quantities for each portion. During the last coating she again commented that one portion should be lightly coated. My son was the first to taste the sauce with the tip of his finger. Based on the convulsions that he experienced I knew the dinner was going to be questionable. As my wife was sitting down and in full denial I dove into a rib which was very tender. The meat fell from the bone as I gobbled it up into my mouth. The flavor was actually quite nice… until the bite of the cayenne pepper caught up with my taste buds. I was the only one that actually downed two whole ribs. The good news is that my sinuses will be clear for several days. The bad news is that we I wasted an entire rack of ribs! Experimenting with new foods and tastes is always a pleasure for me. Wasting money is painful. But for the cost of the meal I did learn two important lessons. 1) My wife should be doing the cooking and 2) When I am too pigheaded to follow the first point, I should heed my wife’s advice! Money Hacks Carnival – Hosted by $Own the Dollar – This week’s carnival is built around the Holiday Theme. Not only does it provide links to some great articles it also provides some interesting information on the history of the Holiday season. Honestly I have only taken a moment to peek at this blog but I will definitely be checking it out further. You should too! Good stuff on the Carnivals Lean! How do you keep track of them all, and choose which to submit to btw? I’ve done a lousy job at submitting to any (1 total), and I’m wondering if there is a more efficient way. .-= Financial Samurai´s last blog ..The Katana 12/14: What’s Your ONE Word Definition of Happiness? =-. Samaurai-san – I certainly have not found the best way yet, time for more Kaizen! I keep a list of them in My Favorites. Best of Money Carnival by FMF must be submitted by Saturday @ 5. It appears all the rest or due by Sunday @ 5. Most require submissions be less than two weeks old. I just pull one up then look through my old posts for something that fits. Ah, thanks Coach-san. Let me have a look! Kaizen is a great word!